After a successful year with box office hit movies and critically acclaimed roles, Rima Kallingal is gearing up for some more outstanding performances with her upcoming movies in Malayalam. The Best actress of 2012 (for '22 Female Kottayam') has very good films ahead in the rest half of 2013. The actress has in store completely different and challenging roles. The new Malayalam movie releases of Rima Kallingal are 'Starring Pournami' -a road movie shot mainly in North India, a comedy flick 'Zachariayude Garbhinikal', hit maker Ranjith's 'Leela The Never ending Play' and an action thriller 'Escape from Uganda'. The actress has been seen in both short and full length roles in 2012 and initial half of 2013. But the new movies like 'Leela – the never ending tale' and 'Escape from Uganda' has the actress in performance oriented roles. Below are the details of the upcoming Malayalam movie of Rima Kallingal. Rima Kallingal handles one of the important character in Aneesh Anwar's 'Zachariayude Garbhinikal'. This is the upcoming movie of Rima Kallingal next to be released. Rima is doing a comic role for the first time in Malayalam through this movie. She is a naughty funny Muslim girl named Fathima. A nurse by profession Fathima visits Dr. Zachariya after she is getting pregnant. Aju Varghese dons the role of Ajmal who has a strong feelings towards Fathima, but the height difference between them restricts him confiding his love to her. This is a full length comedy drama film with a serious subject in it portraying the life of a gynecologist and his treatment of five pregnant patients. Lal comes as the gynecologist Dr. Zachariya and other four heroines are Sanusha, Lakshmi, Asha Sarath and Sandra Thomas. Rima Kallingal will be speaking Kasargod dialect in 'Zachariayude Garbhinikal 'after her Kottayam slang in '22 Female Kottayam'. Written by the director and Aneesh Anwar 'Zachariayude Garbhinikal' is produced by Sandra Thomas and Thomas Joseph Pattathanam. 'Starring Pournami' is the next movie to go on roll of Rima Kallingal. Rima Kallingal will romance Sunny Wayne in this movie. 'Starring Pournami' will be the debut movie of director Albey Antony. The movie will be shoot in North India mainly. Leh, Ledakk and Delhi are the main locations of 'Starring Pournami'. 'Starring Pournami' is written by Vini Viswa Lal and has music composed by Kailas Menon. The director has said that the shooting of the movie will start in the early July as they are waiting for the weather. This Rima Kallingal movie will be a spectacular experience for the viewers. Whereas 'Zachariayude Garbhinikal' has Rima Kallingal doing her first comedy flick, 'Escape from Uganda' will have the actress in an action role. Rima will be seen as the heroine in 'Escape from Uganda', a film extensively shoot in Africa. The film is very special for her not only because of the one month shooting in Africa, but for the action performances of her too. The actress is very excited about this strange offer she has in hand. 'Escape from Uganda' is a real life story and she will play the role of a three year old child's mother. It is the story of a family forced to escape from the Uganda due to some chaos prevailing there. She has learned 'Kalarippayattu' and a form of Manipuri martial arts to gift us with the best action performances. 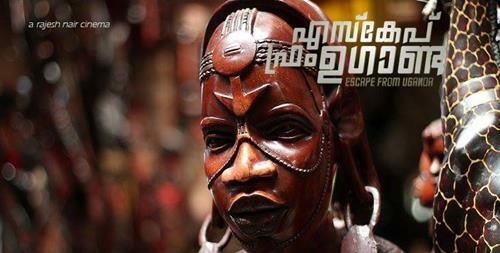 Tamil actor Pratheepan will be doing the role of her husband, the hero in 'Escape from Uganda'. The movie is directed by Rajesh Nair. 'Leela- The never ending play' has been in news for quite a time. It was earlier reported that Ann Augustine will be the heroine of the movie. But the latest news is that 2012 best actress Rima Kalingal has got the golden chance to act in Ranjith's most ambitious project. 'Leela- The never ending play' is based on the short story 'Leela' by R Unni. Rima will pair with Mammotty after 'Bavoottiyude Namathil' and 'Kammath and Kammath'. The movie will be produced by Ranjith himself under the banner of Ranjith's Capitol Theatre. Leela is one of the daring film that has announced recently and Rima's role is also very challenging. The Movie deals with theme sexual anarchy. Rima Kallingal has become one of the in demand actress in other South Indian movies also. But she has never turned her back to challenging roles coming for her. The actress has been going through one of the best time in her profession with a part of current trends and bagging awards and acclamations for her performances. These upcoming Malayalam movies of the actresses are also in the same thread. Malayalam is hoping for more performances from Rima through these new films in 2013.